Was it really meaningless coincidence that just as an alarmed American administration closed down some 20 embassies throughout the Mideast – including the one in hardly unfriendly Tel Aviv – Ft. Hood shooter Nidal Hasan delivered his opening court-martial statement? Although superficially unconnected, these events are inextricably linked. Both expose the shoddy sham that US President Barack Obama struts out as enlightened policy. This should send cold shivers down the spines of those hoodwinked Israelis who still think Obama deserves even a modicum of our trust, to say nothing of actual sacrifice. Hasan’s coldblooded murder in 2009 of 13 and the wounding of a further 32 underscores Obama’s obsessive obfuscation. As Hasan callously mowed down fellow servicemen, he yelled Allahu Akhbar (God is great). It later transpired that long before Hasan launched his attack, the Joint Terrorism Task Force was aware that he maintained steady contact with terror mastermind Anwar al-Awlaki, inquiring, among others, about religious martyrdom. But forewarned isn’t necessarily forearmed. Following whatever logic, the authorities preferred to do nothing. Nonetheless, Hasan, who’s representing himself in court, didn’t subscribe to the “disgruntled employee” scenario. He told it like it was, even if the president and all his mouthpieces desire to claim otherwise. “We the Mujahideen are imperfect Muslims trying to establish the perfect religion in the land of the Supreme God,” he unhesitatingly proclaimed, identifying himself without a hint of equivocation as a jihadist warrior. But the truth is immaterial. The shooting is still not labeled as an act of terror. This is no trifling slipup. It’s the product of a mindset that cripples America’s position in the world, harms its interests and – inter alia – could mean disaster for Israel. The embassy closures are part and parcel of the bamboozlement that parades as sober strategy. One of Obama’s more striking fiascos was the attack on the US Benghazi consulate a year ago. As in Ft. Hood, the administration strove is darndest to convince the gullible public that what looks like a terrorism and kills like terrorism isn’t terrorism. And so the mind-blowing official line was that the American ambassador to Libya and three other embassy staffers were slain because of a stupid obscure YouTube video. This was just as patently false as the “workplace violence” Ft. Hood cover-up. Now, fearful of a rerun of the Benghazi-style non-terrorist event (on the anniversary of the original non-terrorist event), Obama preferred to run and hide from the enemy he says he had already defeated. After having heard Obama’s crow triumphantly that “Bin Laden is dead and Al Qaida is on the ropes,” we encounter a reality in which clearly Al Qaida is has extended its reach, attracts lots more recruits, pockets lots more lucre, is lots more menacing and now frightens the world’s sole superpower into ignominious cowering. Al Qaida is the bully who chases the wimp out of the schoolyard. Does Obama come off looking like the winner in the war against terror? Hardly. But oops, hasn’t Obama consistently denied that such a war is at all waged? This is Obama’s recurrent and persistent theme. “We are not at war with Islam,” he has declaimed repetitively on numerous occasions. By inference, neither is Islam at war with America, or, for that matter with Israel – to say nothing of any other democracy where Muslim terrorists have set off an explosive device or two. Accordingly, what’s needed to counteract them isn’t resolute and rigorous self-defense – certainly not war – but something more akin to pinpointed police action. That’s the rationale for trying Hasan as an irate workman rather than a jihadist terrorist and why the Benghazi slaughter was presented as comeuppance for an insult. On the narrowest pragmatic plane the sentiment isn’t entirely without merit. Why would America, Israel or any democracy desire to portray itself as taking on the whole Muslim world? The last thing we wish or need – or ever wished or needed – is a clash of civilizations. But complicating our wishful thinking is the not-so-negligible matter of whether this is also how militant Islam interprets things. (For the purposes of this deliberation we can justifiably dispense with the travesty called “moderate Islam.” At best – if it’s at all real – Islamic moderation cringes abjectly in a murky twilight zone, mute and invisible). The issue is whether vehement Islam, whose inflammatory rhetoric resonates worldwide, doesn’t regard itself as being in a war with us. Much as we abhor conflict, the choice isn’t exclusively ours. If Islamists incite to battle, can we make do with sitting back, trying to see their point of view, making nice and attempting to sooth their frenzy with brotherly blandishments? This precisely is Obama’s advice. He won the Nobel Peace Prize for the hype that his righteous posture and personable traits can soothe all adversity. Everything boils down to persuasion. And so Obama expected an assortment of the worst international baddies to reward his reasonableness with gentleness and justice. The Muslim world is seething with its own self-generated turmoil, but Obama’s agenda stays immutable. In our arena he’s still intent on removing the presumed triggers for Muslim rage. This is where Israel comes in – the much-demonized fly in the Arab/Muslim ointment and the regional-scale counterpart to Hasan’s workplace disenchantment or to the YouTube affront. To judge from Obama’s glib patter, all which kindles Arab/Muslim volatility are the territories Israel won in the Six Day War (when a beleaguered small nation, openly threatened with genocide, was forced to defend itself). Browbeaten, we play along, in the desperate hope that we’ll thereby gain a morsel of approval. Hence Netanyahu acquiesced, despite himself, to the two-state cliché instead of exclaiming that it’s nothing but a red-herring – a propaganda ploy geared to divert world attention from much more sinister ultimate objectives vis-à-vis the Jewish state. Little Israel’s very existence ignites Arab passions, not its size. This hankering after the morsel compelled Netanyahu to restart negotiations based (admit it or not) on the Obama’s implicit diktat – a return to the pre-1967 Green Line (the 1949 armistice lines). In essence Obama demands we cede 95% of everything beyond 1949 lines, and offer giveaways for the remaining 5%. These are capitulation terms rather than the victor’s magnanimity. We often forget that we were forced to defend ourselves in 1967 and that we won. Wholesale retreat would mean the wholesale need to re-house hundreds of thousands of uprooted Israelis, the encirclement of re-divided Jerusalem and the rise of a new Hamastan – on the direct doorstep of most us in densely packed central Israel. Hamas will triumph in Judenrein Judea and Samaria just as it had in Judenrein Gaza. Just as Jimmy Carter’s credulity bequeathed us the Ayatollahs’ theocracy and spawned a belligerent Iran with nuclear ambitions, so Obama will leave us an Iranian proxy atop Israel’s soft underbelly. And just to facilitate placing our collective national head in the noose, Israel was obliged to pay an entry fee to the gallows via the release of some of the worst convicted terrorist mass-murderers behind bars. Rumor is that Netanyahu was lured by promises of American participation in stymieing Iran’s nukes project. Though thoroughly unsubstantiated, the implied trade-off is that Israel must mount the Palestinian gallows in order to dodge the Iranian bomb. Proponents of this narrative maintain that Israel is actually helpless against Iran and depends for its survival on American anti-Iranian action. The only way Obama will rescue us from one existential peril is if we exacerbate another existential peril. This is Obama’s monstrously magnified version of Hobson’s comparatively innocuous choice. 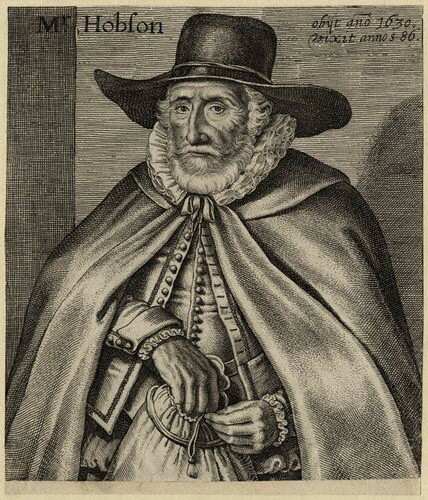 Thomas Hobson (1544-1631) was a notorious English liveryman who pretended to offer his customers the pick of his horses but in fact gave them no option. Obama seemingly offers Israel a free choice but in fact aims to leave it with no viable alternative. In so many words he tells us that it’s his way or the highway. Yet is no price too high to pay for the hazy hypothetical that Obama would free us from Iranian danger? Are we indeed as impotent as some spinmeisters would have us believe? If we can help ourselves even a little, is the further compromising of our self-preservation prospects sane? The buzz about Obama’s alleged variation on Hobson’s choice might be altogether unfounded. In that case all we’d supposedly gain from going to the gallows is the hope that we can at the last moment avoid execution but in the meanwhile diminish our excruciating delegitimization abroad. Our delegitimization, though, is inextricably bound with Obama’s perception that there’s no conflict with Islam and that peace on earth and goodwill to all men would be at hand… if Israel weren’t in the way. With that in mind, can anyone seriously count on Obama to fight Israel’s fight? He hasn’t exactly been eager to fight America’s own fight. Hence the panicky evacuation of US embassies. Hence the preposterous resort to the YouTube pretext and the workplace violence charade. If a country like the USA cannot support, lead or get its own house in order regarding the Middle East, then why should anyone (especially Israel) expect positive USA leadership to direct or positively influence countries and scenarios on a more global scale. It undermines Israel and leaves it more vulnerable than usual. Yet again we see that we are on our own in the final analysis. Purportedly told by the USA what to do, when to do it (and how high to jump!) – and for what? Loyalty and protection? Security and Peace? Israel really must consider saying “no” on occasions, in order to regain self respect, defend it’s stand and principles and be seen to be independent of the USA in philosophy, behaviour and goals. The folly of the present weak relationship twixt the USA and Israel, is as a result of transient disassociated policy, leadership and direction mainly by the USA and to a lesser degree also by Israel. The recent release of “murderers” being a perfect example. This gives succour, encouragement and strength to our enemies – and shows and absence of clearly defined policy or direction. Trust, respect, perceived wisdom and strength are fundamental necessities of good leadership, and regrettably it is arguable that these traits are at present, in short supply in Israel and the USA. The effect is proving devastating! Short term gain will undoubtedly prove to be long term folly. Our history seems to be the only element that never seems to change. Whether or not the last thing we need is a clash of civilizations we have one and have had it for 1400 years. It only went into abeyance in 1683 at the gates of Vienna and has resumed with a vengeance with the influx of petrol dollars. (And of course Israel cannot count on anybody but Israel.) The facts say that obama is intent on furthering the cause of the Muslim Brotherhood across the ME. Whether or not he is a practicing muslim, his sympathies are with islam (“for the Islamic faith, which has done so much over so many centuries to shape the world for the better, including in my own country.”) and not the West. No one is faultless. We can thank GW Bush for the laughable narrative of peaceful islam to emerge so strongly since 9/11. The Libya lies were to cover up gun running to miltants in Syria and the Ft. Hood lies are an attempt to point blame where we should point blame, at the koran and its most vocal and strident followers. You have pointed out correctly the cruz of the matter. The world has come to believe that peace would flourish if only those recalcitrant Jews would allow it to. Until the narrative changes Israel is headed for disaster. without widespread public support, what’s the problem? Morsi and Erdogan are following in HItler’s footsteps: one vote, one time. An object lesson may, hopefully, trump a “Hobson’s Choice”. Obama will NEVER EVER act against Irans nuclear Holocaust project…EVEN A COMPLETE IDIOT knows that simple fact ! Israel MUST carry out a first strike against Irans nuke plants…it will work and change the whole political equation in it’s favour ! Sometimes, the “friends” are the REAL ENEMIES…!!! KERRY, NOT ABBAS IS ISRAELS REAL ENEMY ! Great, great article–very honest, and straight from the heart. I despise Barack Obama, and all that he’s done to turn America into a nation of ignorant sheep, and destroy Israel. Yet I must consider that one main reason he’s been successful at doing this, is that he’s protected by corrupt Republicans–Speaker of the House John Boehner, and Eric Cantor. Boehner obstinately refuses to form a special committee(one, not the five he currently has in place) to investigate Benghazi. The result is that nearly a year later, the perpetrators of the killings of Ambassador Stevens, and Messrs. Woods, Smith, and Doherty, are still at large; and we still don’t know for sure exactly what happened. The Benghazi survivors are being hidden and silenced by the government. Yet it gets worse. In August 2011, an aging 1960’s era Chinook helicopter, carrying 30 US Navy SEALS and 8 Afghan troops, was shot down in Afghanistan; only a couple of months after the SEALS had killed Osama bin Laden. Evidence is now coming out that the helicopter flew into an ambush, that Obama knew about, and may even have been complicit in. The SEALS knew, before they boarded the helicopter, what was going to happen. The government has lied about it, saying they were forced to cremate the bodies of the dead SEALS, and that the helicopter’s “Black Box” was washed away in a flood. ….and as far as what Netanyahu may have gotten in return for the release of the 104 thugs, I can only say that I hope it was substantial assistance on Iran. I can’t imagine that Binyamin Netanyahu wouldn’t have a very good reason for putting Israelis at risk, in this manner. Yet. stranger things have happened. Israel does not expect American participation to fight Iran. It just needs the Americans not preventing Israel doing the job itself! The realization of the fact that there is absolutely no way to stop Iran except by military means redefines the importance or weight factors of all other issues relative to Iran. They become insignificant, save as a possible way to help the primary cause which is stopping Iran. What is the point of considering the negative implications of the 104 prisoners when if Netanyhhu fails in the primary task of saving Israel from an Iranian nuclear strike the 104 prisoners issue would not exist since Israel would cease to exist. However, in order to understand the magnitude of the Iranian threat we need to know what are the motives that drive that threat. We have to understand what Iranian Twelvers believe in — Shia eschatology and the Mahdi -which render the mutually assured destruction doctrine MAD ineffective. Sarah Honig never mentions any of this WHY DOES’NT SHE? How can she explain the real context the government decisions are made in when she skips over what Bernard Lewis says about Iran, she fails to explain that Iranian Twelvers would be capable of killing 2/3 of humanity in order to bring back the Mahdi from occultation. ( see Deterrence is irrelevant by Israel Kassnett). Until she stops skipping over what is really at stake she has no right to criticize the government which still has to take the factors Sarah Honing never took into account into account when they make their decisions. The article isn’t focused on the motivation for Iran’s pathological threat to world peace. I’m not speaking for her, but perhaps she believes that Binyamin Netanyahu has done a good enough job of telling the world how Iran is impervious to MAD. (He’s spoken about this many, many times) However, Sarah has never criticized the government over anything trivial; even though she has the right to do that. Mladen, you fail to grasp a very elementary reality. A column of limited length cannot include EVERYHING. Even a series of academic books cannot, much less one op-ed. The subject of this piece is NOT Shiite theology or Iranian theocracy. The subject here is Obama’s attitude to Israel. You cannot blame Sarah Honig for not choosing the topic Mladen would have preferred she chose. You cannot blame an apple for not being an orange! It seems Israel has few illusions left about Obama, but now has fears of him aplenty instead, and for good reason, because Obama is an enemy of Israel. Intimidating as this fact is, it can be faced squarely with a clear head and firm resolve not to fold under pressure. Trouble is, another fact stands in the way of such resolve: the vast majority of Jews in the United States are infatuated with Obama. Basking in this adoration, he pressures Israel with little fear of Jewish pushback. Yes Sarah, the buzz about Obama’s alleged variation on Hobson’s choice is PURE NONSENSE…you know it and I know it…oh well. Israel is damned if it does and Israel is damned if it doesn’t. Israel is expected to facilitate the conditions for its own destruction. Far from “never again,” the Jews quietly appear to be walking towards the virtual gas chambers of the future without a word of protest – at the behest of Obama and Kerry! As the world’s only Jewish State, Israel is in expected to facilitate the conditions of its own destruction. The “peace process” has nothing to do with the world’s demands on Israel. No matter how accommodating Israel might seek to be, or its leaders grovel before those who hate their country, the intensity of cries and rage mount and mount against it. Far from “never again,” Israel’s Jews appear to be walking to the virtual gas chambers of the future without breathing a word of protest – at the behest of Obama and Kerry! Countries do die… not only by foreign conquest but when they lost their moral compass and raison d’etre. Things change…. if the peace of the grave is worth it, Israel should at least get something for it. What have all those “painful sacrifices” accomplished, past or present? Its a good question, indeed. The Boston Bombings can accordingly be called a non-overseas counter-contingency operation. It also was a workplace incident, since Tamerlan Zaniev was an athlete, a boxer, and the marathon was a sporting event.